Yall have a "wormderful" weekend! My blog isn't specific to worms though I have an article on vermiculture posted. Feel free to comment and help me improve it. Most of my training in agronomy focused on soils, and soil microorganisms like mycorrhizal fungi. While the articles are relevant to organic gardening I also include information for those who - like me - also use conventional methods judiciously. Posted a pic on my page of the head of romaine lettuce the bin occupants devoured in 5 days. There is part of 1 leaf left and the isops are polishing that off as we speak. Did notice worms liked to follow the progress ON and IN the lettuce. Thats the only item (other than egg carton) I have seen above bedding level that the worms actually get on. Also collected almost a quart of leachate, which I "filtered" thru and old fryer splatter screen. 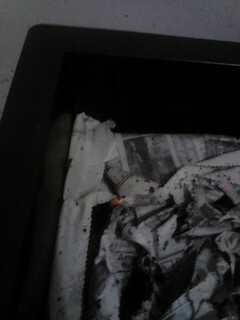 Note to self: Vermicomposting is not conducive to daily blogging. From one day to the next, there isn't a lot happening and no riveting changes to document. How many posts consisting of "hey, look - worms!" can one realistically post without degenerating into the inanities of minutiae? However, two things happened in Week 2 of The Great Worm Experiment that are worth noting. Once again I added 2 500mg calcium tablets, ground fine with mortar and pestle to my worm bin as I do once ever 4 months or so and a few days after their breeding was so profuse that I saw many in plain view in the act of exchanging sperm when I checked the surface activity. Seems that calcium or perhaps a sudden drop in acidity stimulates mating and cocoon production. have pics of BSF eggs? Just added some photos of what I hope are BSFL. These critters make short work of veggie waste and coffee grounds. I put 1/4 cup grounds in with filter yesterday mornin and all that's left is *most* of the filter! wow! After leaving the worms alone for the past few days, I decided to check on our little friends and see how they were getting on. They seem to have spread throughout the bedding, including the corner with the coffee grounds and filter, as shown below. Yay! Wormies came today. Nobody who knows me can believe how so completely INTO the vermicomposting I am, because I'm terrified of bugs. Yes, I do know that worms aren't insects, but still, they fall into the same creepy, crawly, ugly to look at (don't tell them I said that, don't want to compromise their motivation or give them complexes on their first day in a new home) category of "things that creep/gross/freak me out". I'm from Lugoff (pronounced Lew'gawf), SC. Have been a member of this wonderfully informational site since early April 2012, but just got my bin started May 22. Gathered info and combined a few ideas for my bin. The instructions for The Worm Factory say to leave the worms alone for a few days to let them recover from the stress of transport and get acclimated to their new environment. The bin is currently in our utility room. We leave the light on 24/7 in there for reasons unrelated to vermicomposting and it's the only area of the house in which I felt comfortable leaving potentially fleeing worms unattended overnight.